In the last post, we discussed the new Leftist/Neptunian propaganda film "Elysium", created by sci-fi wunderkind Neill Blomkamp and starring Hollywood A-lister Matt Damon. Today we look at the astrological charts for both men to see what astrology tells us about their political views. 1. Pallas is trine Pluto, which is parallel with the North Node. Authoritarian tendencies/potential. This may be slightly mitigated by Sun and Mercury loosely conjunct Venus, which is sesquiquadrate Pallas. 2. 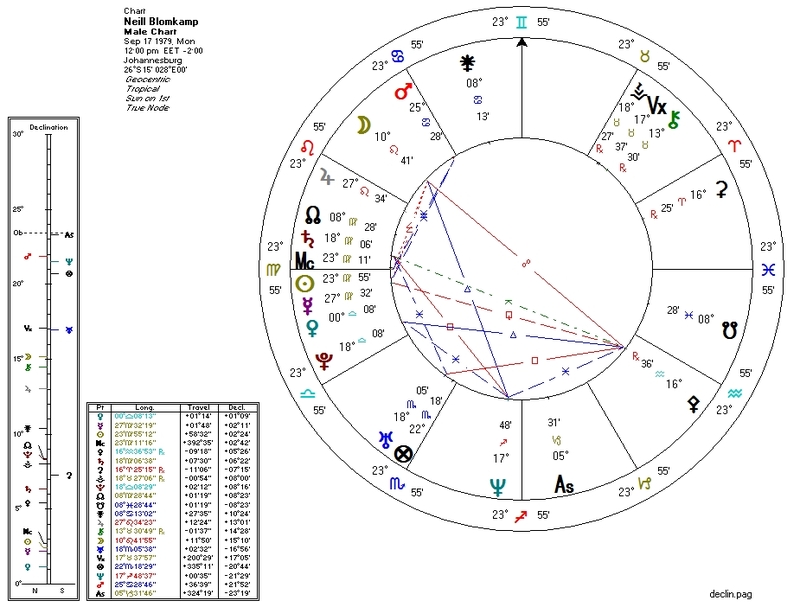 Venus forms no slam-dunk connections with Neptune or the Nodes (though Neptune close to the Venus/South-Node midpoint is interesting). Without a time of birth we can't determine what Neptune or the Nodes are doing with the Second House and its ruler. If we had a birth time, we might see such a connection. For several hundred examples of such correlations, see here. 3. 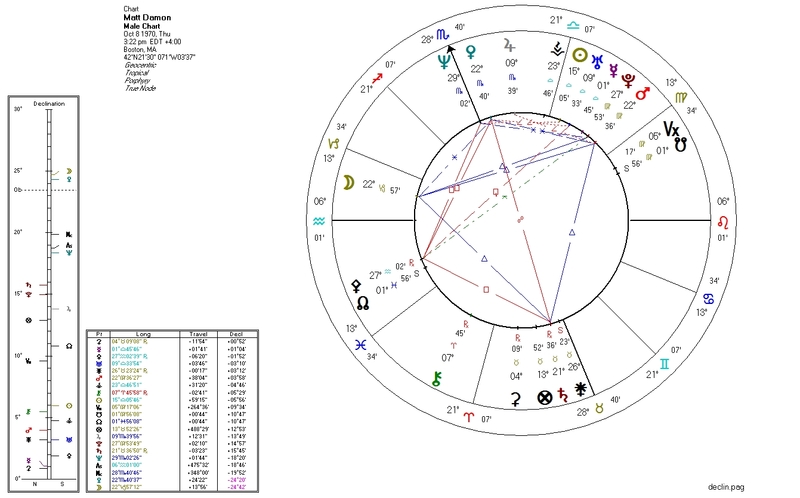 Moon, depending on time of birth, is going to be either trine Neptune, quincunx the South Node, or both. The Moon's ruler (the Sun) is square Neptune and quindecile the South Node either way. "Elysium" tells us we're absolutely looking at a cultural liberal, and the chart agrees. 1. Pallas. Pluto is quincunx Pallas and trine/parallel her co-ruler Saturn... but as with many born in 1970 (like "Dark Knight" trilogy director Christopher Nolan), he has Pallas conjunct the North Node. With regard to Pallas, the North Node can seriously strengthen a native's ethical consciousness, especially over time. 2. Venus conjunct Neptune and opposite Saturn. Leftist economic leanings, probably partially offset by the Pallas placement. 3. Moon, ruled by Saturn which is opposite Neptune. Cultural liberalism. No surprises here: Damon is a modern progressive like director Blomkamp, but has a strong enough Pallas to put him in the more ethically consistent "principled progressive" camp that very often aligns with libertarians.